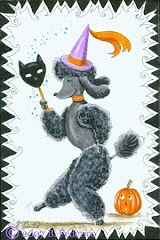 Witchy Poodle Artist: Tag....I'm It! 1. Growing up I used to be so shy, I'd walk with my head down. Everyone thought I was a snob! 2. I like to read those silly, romantic comedy books. Yet I can't stand to watch sappy chick flicks. Comedies and animations are what I like to watch. 3. I live and breath art. I wake up in the mornings and design art in my head. 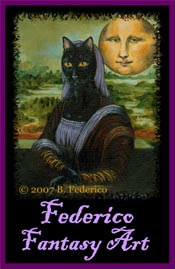 After my spiritual exercises in the evening before I fall asleep, I design art in my head. Now all I need is the time to create all of these designs! 4. I belong to a New Age religion called Eckankar. 5. 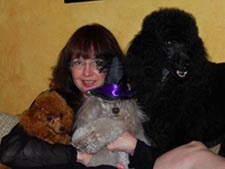 I sing and dance with my poodles. They love it! 1. Post these rules on your Blog. 2. Link to your Tagger. This is a wonderful PR tool for the GOOGLE search engines. HENCE THE NAME TAGGED! 3. Share 5 facts about yourself on your Blog. Some facts can be random & some unusual. Sharing on Tagger's Blog is optional. 4. Tag 5 people at the end of your post by leaving their names as well as links to their Blogs. 5. Let them know they are Tagged by leaving a comment on their Blog. Hi Becky, you write very well. Your RANDOM 5 is truly entertaining. Love the Samba music too. 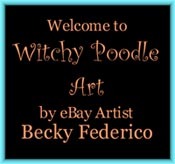 Great Poodle Parody Paintings & Cigar Purse, that is a tongue twister. 1) I think Michael Jackson is the greatest entertainer of ALL TIME and I'm his biggest fan! 2) I love rum and cokes with Captain Morgan spiced rum (w/lime)...fave cocktail. 3) My Mom is my best friend. 4) I have been drawing since I was 5 years old. I was challenged by a neighbor to copy a cartoon character on a dare at the age of ten, in less than 10 minutes made a perfect copy! 5) "Absolutely Fabulous" is my all time favorite TV show...close second is "Golden Girls!" I can watch them over and over and never get tired of them! !